Are you feeling out of balance, but you’re not sure why? It could be that the energy flow in your body is blocked. Life experiences such as stress, trauma and illness can create imbalances in our body, mind and soul which lead us to ‘dis-ease’ (disease is just ‘dis-ease’ in the body). This ‘dis-ease’ can be temporary, but it can also persist, perhaps even leading to chronic illness or habitual patterns of negative thinking which affect our lives. Our bodies are made up of energy – we are all vibrational beings made up of energy centres, called ‘chakras,’ which need to be vibrating at a balanced frequency for us to be in harmony. There are a few ways you can ensure you keep your chakras in equilibrium – read on for more information on how you can ‘sit with the scents’, using essential oils and mindfulness techniques to balance the chakras! Originally recognised by Eastern cultures, chakras (or ‘wheels’ in Sanksrit) are the body’s seven vital energy centres. They are seen to be important for our physical, emotional and spiritual health and, though they cannot be physically seen using any scans, they are energy channels which spin in a clockwise direction, almost in a circular pattern like spinning vortexes in our bodies. Balanced chakras allow energy to flow freely, creating harmony. When our bodies - or minds and souls - are stressed, these ‘wheels’ can spin in different directions and at different speeds, meaning our body’s energetic vibrational frequency is altered, leaving us susceptible to imbalance. Commonly re-aligned through reiki therapy, as well as yoga and meditation, they can also be balanced with the help of essential oils! The colours each of the chakras are associated with can help balance them. If you are not feeling particularly grounded, for example, then wearing the colour red can help increase the frequency of the base chakra’s vibrations. Likewise, visualising yourself surrounded in this colour can help – or using crystals, such as red garnet for the root chakra, can all contribute to regulating the body’s energy frequency. Perhaps most excitingly, though - essential oils can be beneficial in re-balancing the body’s energy centres too! 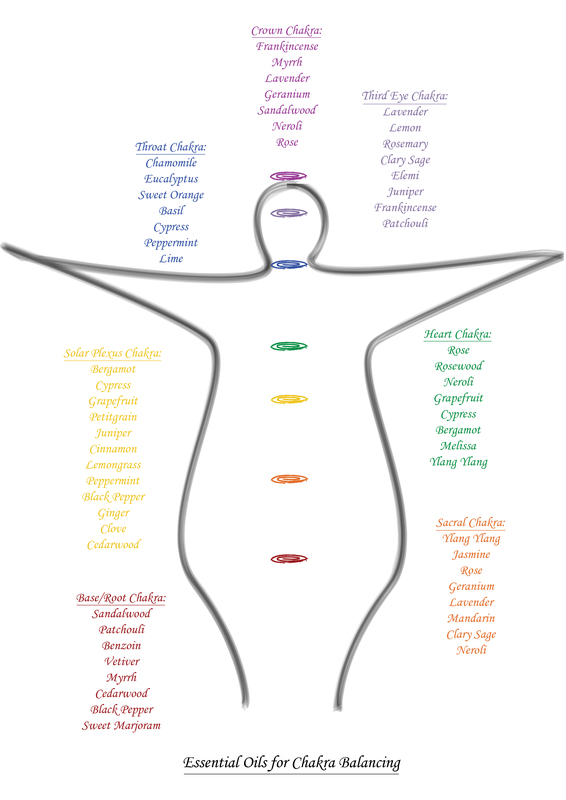 Which essential oils balance which chakras? Now you know which essential oils you can use, you can get blending! Below are some of our top tips, followed by techniques and blend ideas. Whichever you choose, though, the key is to use essential oils ‘mindfully’ so you notice the subtle changes going on in your body, mind and soul as you balance your chakras. Whilst using your essential oils, create a safe and happy space, allow yourself quiet time and listen to yourself: hold your space and let your intuition guide you. This is always important when working with energetic therapy. Work with the aromatherapy oils that you feel help address your chakra energy imbalances. Also, let your nose guide you – choose the scents you like! When using the oils, I recommend journaling about which oils you have chosen, writing about how they made you feel or what you noticed during and after. Notice how you feel after using the essential oils and the different techniques, compared to how you felt before. Get in tune with your body. Try using the oils every day for a week – try a week of different techniques – see which ones you like – and then try using the same (your favourite) technique for a week and notice the difference! Try a variety of oils in different blends; see which ones have the best effects. Mix it up! Try self-healing with a full ‘Seven Chakra Balance.’ Create a safe space for healing with a lovely candle in a dark and quiet room. Select one essential oil for each chakra and put a few drops of each oil on a separate cotton pad, lining your 7 pads up in order. Starting with the base chakra, inhale using your base chakra cotton pad whilst holding your hands on or over your base chakra (lower abdomen or feet) with the intention of healing, also focusing on regulating your breath. Work your way up your body, working each chakra with its relative oil, until you reach the crown chakra. Notice how it feels – where are the imbalances? This is my personal favourite tip for chakra balancing! Diffuse your chosen blend into the room, day or night – add 3 drops of up to 3 different essential oils in water in your candle burner or aromatherapy diffuser. Allow yourself time and space to sit with the scents and let your mind drift. This is great whilst meditating, especially with crown chakra blends! Mix 2 drops of up to 3 different oils in 15ml of carrier oil – such as Grapeseed or Sweet Almond – and massage your chakra blends into the area of the body you are focusing on. This will mean that the essential oils get absorbed into your blood stream and can stay in your body, working to balance your chakras, for up to a week. This is great for things like throat, heart, solar plexus and sacral chakra balancing – and can be really relaxing too! Create a spritz of your favourite blend and use it during yoga, breathwork or meditation! Add up to 30 drops of essential oils in 100ml of a chosen hydrolat and pop it in a spray bottle. A lovely grounding blend could work wonderfully here! Add a few drops of the essential oils you have chosen into a bath blend – mix up to 2 drops each of 3 essential oils with half a cup of full fat milk and pop it into your bath! Or try adding to 15ml of Base Formula’s SLS Free Bath & Shower Gel! Whilst you are in the bath, sit and focus your attention on sending energy to the particular chakra you want to help balance, breathing into that part of the body. Notice how it feels. Try an aura cleanse! Whilst your chakras are within your body, they also extend into your aura which is the energetic field surrounding your body. Select the oils you want to work with and place them on a cotton pad next to the bed so you can inhale them. Lemon, Lime and Bergamot are great cleansing oils for this! Lying on your back, take your hands about 1-2 feet away from your body, slowly start to hover your hands over your base chakra (feet) and see if you can feel a slight resistance as you enter into your aura. Once you feel it, work your way up all your chakras, inhaling and exhaling the scent of your blend, with the intention of cleansing your aura. Base: 2 drops of each of Sandalwood, Patchouli and Cedarwood – a beautiful, extremely grounding blend! Sacral: 1 drop Ylang Ylang, 2 drops Jasmine and 3 drops of Mandarin – a gorgeous, floral and sensual blend. Solar Plexus: 3 drops Bergamot, 2 drops Cypress and 1 drop of Ginger or Cinnamon – a warming and reassuring mix. Heart: 2 drops of each of Rose, Neroli and Rosewood – a loving combination of comforting oils – like a hug in a bottle! Throat: 3 drops Sweet Orange, 2 drops Lime and 1 drop Chamomile – a creative blend to aid expression! Third Eye: 2 drops Lemon, 3 drops Lavender and 1 drop Rosemary – a stimulating mixture for concentration and intuition. Crown: 3 drops Neroli, 2 drops Geranium and 1 drop Frankincense – a calming, mind clearing, meditative blend. So - what are you waiting for? Try that Seven Chakra Balance today! Sit with the scents, and mindfully balance your chakras with the help of beautifully scented, therapeutic essential oils.